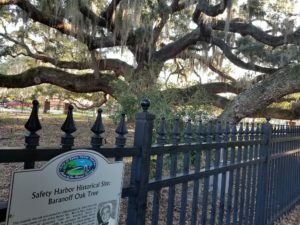 The Safety Harbor City Commission will consider buying the land that includes the Baranoff Oak Tree when it meets Monday night. What is it? The Baranoff Park property includes four platted lots at the corner of Main Street and 2nd Avenue North, which includes the historic Baranoff Oak Tree. City staff has negotiated a purchase of the entire property for $1 million from UCITA Properties LLC. What’s the issue? Commissioner Andy Zodrow made buying the land a central theme of his most recent re-election campaign, warning that the land – including where the Baranoff Oak Tree is – could be developed if the city didn’t buy it. Soon after the election, Mayor Joe Ayoub proposed buying the land, and Commission was unanimous in wanting to do so. The city plans to make some improvements to the portion of the property that fronts Main Street, but keep it undeveloped as a passive park. UCITA will keep the shared parking and dumpster and drainage easement agreements it has under its current agreement with the city. What decision needs to be made? Commission may approve, amend or reject the purchase. Approval of millage rate and fiscal year 2019 budget: Commission voted 5-0 on first reading on Sept. 4 to keep the city’s millage rate at 3.95, and voted 4-1 at the same meeting in favor of the $76 million fiscal year 2019 budget. Commissioner Cliff Merz voted no out of concern for the long-term financial implications of a 3 percent merit raise for city employees if Florida Amendment 1 passes on Nov. 6. The amendment would increase homestead exemptions for some property owners and cost the city an estimated $300,000 in tax revenue the first year. Merz suggested holding off of on the raises and giving employees bonuses instead if Amendment 1 passes. Revising business tax application requirements: Commission voted 5-0 on first reading Sept. 4 to change the start date for business tax receipts and revising exemptions for veterans and others, based on changes to Florida statutes. Contract to build Community Center fitness room: Commission previously voted to add a fitness room to the Safety Harbor Community Center, and is now being asked to approve the contract for construction. GSA Contracting Inc. submitted the lowest of the three bids received – $708,435. Extension of restrictions in the Coastal High Hazard Area: These are changes to the city’s land development code suggested by Forward Pinellas to make them consistent with countywide rules. Commission had voted 5-0 on the initial first reading to approve the changes, but voted 5-0 on second reading to make a change, suggested by Merz, to ban transfers of development rights within the city’s Coastal High Hazard Areas. The city had to re-advertise the ordinance because of that change, so this will be the first reading on the revised ordinance. Tampa Bay Regional Resiliency Coalition memorandum of understanding: The Tampa Bay Regional Resiliency Coalition, whose mission is “to coordinate climate adaption and mitigation activities across county lines,” is asking local governments to approve a memorandum of understanding to work together on the Coalition’s objectives. Budget amendment: Commission will be asked to approve several transfers of monies between city funds, most of which are tied to the city’s purchase of two new properties, which were approved at the Sept. 4 meeting. Capital assets removal: A housekeeping item, this removes from the city’s general ledger more than $1 million in capital assets that are no longer needed or no longer owned by the city. The depreciated value of the assets in question is zero. Library Advisory Board appointment: The terms of four members of this board, which advises Commission on library issues, are expiring. Amanda Gillespie is not seeking re-appointment, but Casey Harrison, Elyse Kelly and alternate Kelly Nelson would like to be re-appointed. Edmund Ziegler and Jude Ryan also have applied to be appointed. Consent agenda: Items expected to have little debate, such as approval of the last meeting’s minutes and most contracts, are included en masse in the consent agenda, though any Commissioner can ask for any item to be considered separately. This meeting’s consent agenda includes approval of interlocal agreements with Pinellas County libraries and Forward Pinellas, which is the county’s metropolitan planning organization, as well as approval of contracts for a water main replacement and for the Pinellas County Sheriff’s Office to provide law enforcement services to the city. Please keep the tree! To let it be destroyed all for more construction, would not only lose the beauty and history, but a significant source of the charm of Safety Harbor.